Our research focus is to elucidate molecular mechanisms regulating cellular immune responses using the opportunistic pathogen Toxoplasma gondii. Proper immune system function is paramount for human survival against infectious disease. 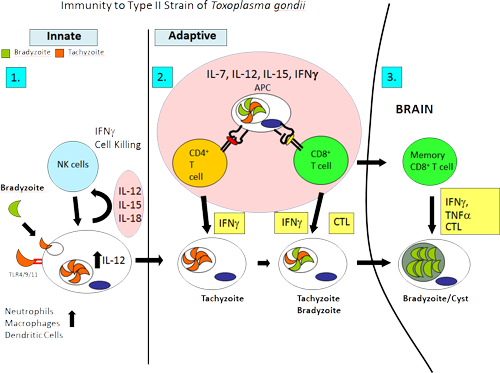 Toxoplasma gondii is a significant (up to 80% in some human populations) opportunistic intracellular parasite present throughout the world causing severe morbidity and mortality in the developing fetus and immune suppressed people (HIV/AIDS). Once acquired infection persists for life requiring continuous life long cellular immunity (CD8 memory T cell and IFNγ dependent) for host survival. Development of this response relies on both secreted and non-secreted factors mediating intricate communication and interaction between cells of the innate and adaptive arms of immunity (Figure 1). Natural Killer (NK) cells are innate immune cells critical for initiating responses and early parasite control, yet, the machinery governing their response is still unclear. 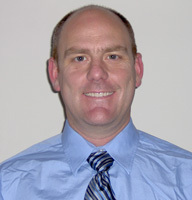 Aim 1: Understand the molecular regulation of NK cell responsiveness during T. gondii infection. Immune system instability can result in the development of autoimmunity, cancer, susceptibility to infectious pathogens and chronic infection. Many pathogens contribute to and take advantage of this to promote their survival and worldwide spread. Interestingly, recent evidence suggests that similar to chronic viral infections, long lasting immune responses to T. gondii are unstable. 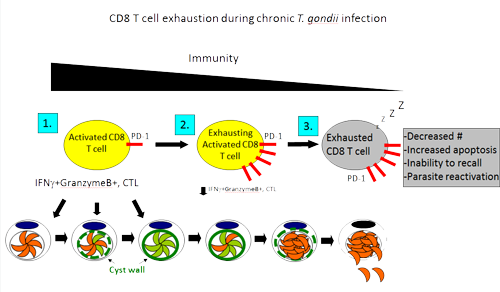 Although the host contributes to this instability via expression of down-regulatory proteins (PD-1) on the surface of the CD8 T cells (Figure 2), whether and how the parasite contributes to this outcome is unclear. Aim 2: Identify parasite factors that modify host cellular immune responses and their role in pathogenesis. Ultimately, we hope to discover novel immunological pathways and host-pathogen interactions to advance immunotherapeutic design.